If you’re serious about getting fit and losing weight, not to mention living an active and healthy lifestyle, then you know that cardio is a super important to being successful. Cardio strengthens your cardiovascular system, boosts your endurance and helps you burn off the fat, so that you can show off your lean muscle underneath. While you need to be doing strength training as well in order to see the best results, the type of cardio you do and the intensity you do it at is going to make a big difference when it comes to reaching your goals. While going long as slow might boost your endurance, you’re going to see better results in muscle tone and fat loss with higher intensity routines. Of course, before you get started with any workout routine, you want to make sure you have the attire and gear that are going to maximize your workouts and keep you motivated! Feeling great about the way you look in your activewear can inspire you to wear it and show it off, which means you’ll be more likely to actually use it! Compression activewear is a must no matter what you’re doing for your workouts. It stimulates perspiration so that you’ll experience a higher intensity workout and get the burn that you need. A workout waist trainer is also a must for amping up the intensity and targeting thermal activity in your core. And a supportive, breathable sports bra ensures that you get the support you need while staying dry and comfortable. So, what you need is compression leggings + waist trainer + breathable, supportive sports bra and you’re almost good to go! The last piece is a pair of cross training shoes, which are going to be the most versatile and give you the best support and flexibility you need for varying cardio moves. Otherwise, if you go on long runs, switch to high quality running shoes. High-intensity interval training (HIIT) will give you the most bang for your buck when it comes to effective cardio workouts. Even if you do just twenty minutes of varying moves, you will sweat hard, breathe hard and burn a lot of calories. It’s important to follow intervals that keep you moving and work all of your muscle groups quickly. Generally it’s helpful to join a class or follow a scripted circuit for timed intervals. Check out this 20-minute HIIT Circuit that pairs perfectly with a waist training routine. An elliptical machine can be a great choice if you’re looking for a low-impact cardio alternative to running or stair climber routine. Just be sure that you’re getting the most out of your workout. You could zone out on a low speed for an hour and see minimal results. To boost the intensity, vary the speed, incline and resistance on the elliptical so that it is making your muscles burn and your heart to beat fast. You can use a programmed routine or adjust to your own ability level. A high incline will work your glutes harder, while a lower incline will work your quads. Try to hit all of your muscle groups. Remember, quality over quantity is what works when it comes to burning fat! Choose a 20-minute routine of challenging intervals rather than a longer, less challenging routine. Climbing stairs requires more muscles than walking, but be sure to vary your speed to get the best results. Overall this is a great way to strengthen your legs in a functional way. Do be cautious, however, if you have bad knees, as a stair climber can be hard on your joints. As a way to mix it up, try climbing stairs for just a short portion of your cardio routine along with some other strength training or cardio exercises. The variety will more effectively work your muscles and keep you sweating. As with any other cardio exercise, the effectiveness of running all depends on the way you approach it. If you regularly run for an hour at a slow speed and little to no incline, you’re going to be building a distance runner’s body, which is lean but might not have a lot of muscle tone or shape. Even if you are training for a longer run like a half or full marathon, it’s still advisable to vary your routine so that you’re building strength and burning fat in addition to increasing your endurance. You can actually get a very effective running workout in a short period of time by adding variations like hills or intervals of varying speeds. You can do this on a treadmill, or you can plan your running routes accordingly. If you’re going out on your own, you should be running hard and breathing hard enough that you’re unable to carry on a conversation without gasping for air between words. Save the small talk for your warm-up and cool-down, and get down to business during your workout. You can effectively burn a lot of calories this way in just 20 minutes. There’s a reason student athletes call sprinting intervals “suicides” and coaches use them for punishment. They’re hard, and they work! While it can be hard on your body to do a whole lot of sprinting, adding some of it into any workout routine will be highly effective. If you’re on a track, try sprinting for a lap and then jogging for a lap to recover. Running around town, sprint for a block and then jog for a block. On the treadmill, sprint for 20 seconds and then jog for a minute. Do this for about 20 minutes and you’ve finished a very effective workout! This is a unique and effective approach to cardio because it requires your whole body to do it and can get your heart pumping quickly. As will all exercises, you’ll get the best results if you vary your speed and do short “sprints” in between longer periods at a moderate pace. To work all of your muscle groups, make sure you’re keeping your chest up and consciously rowing with your whole body. Try this quick, effective rowing workout: set a clock for 20 minutes. Row about 800 feet as fast as you can, go at a recovery pace for one minute, and repeat until the clock is up. To get the most out of a cycling workout you have to be willing to sustain a pretty grueling pace with decent recent and not succumb to getting too caught up in distractions like a smartphone or a TV. This is why at the gym it’s probably most effective to join a class with an instructor who will help you vary your speed and keep up an intensity that will challenge you. If you really focus on sweating hard, you can get a good cycling workout in 30 minutes or less. And it’s challenging to keep up a good speed and resistance going if you cycle outside, it’s still worth the effort if you can bike when you can, especially if it replaces the time you would have spent sitting in a car. 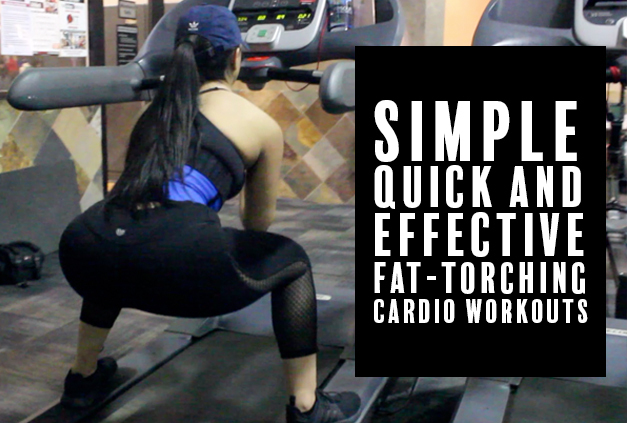 While lifting weights isn’t exactly, you can easily integrate some fat-torching cardio in a strength training circuit if you’re smart about it. By lifting heavy and focusing on alternating muscle groups so that you don’t take long groups, you’ll be sweating pretty hard by the time you’re done. In general, since leg exercise require a lot of exertion, they will get your heart pumping effectively. Try this circuit of simple booty-building exercises as well as this 30-day Booty-Building Challenge. Any routine that swings kettlebells will also strengthen your muscles while kicking up your heart rate. When you’re short on time and equipment, a simple jump rope is all you need to get sweating hard and fast. You can do a quick stand-alone workout, or do some jumping at the end of a lifting routine. To wear yourself out, just see how long you can go! If you can keep it up for 30 minutes, you’ll burn a ton of calories. You can also try jumping as fast as you can for a minute, recovering for about 30 seconds and then repeating until you’re exhausted. There are a lot of ways you can get a quick workout in when you’re in a time crunch. You can “take ten” with your waist trainer and a yoga mat with these moves, or try these sculpting exercises that are especially effective at firming up your midsection when used with a waist trainer. The options are limitless when it comes to fun, quick and effective ways to get in the cardio you need to build your endurance and burn away the fat. Do some of these routines either in between your strength training workouts or even woven into them, like in between sets or after you’re done lifting.